The UN’s human rights chief says an inquiry has produced evidence that war crimes were authorized in Syria at the “highest level,” including by President Bashar al-Assad. It is the first time the UN’s human rights office has so directly implicated Assad. Commissioner Navi Pillay said her office held a list of others implicated by the inquiry. The UN’s commission of inquiry into Syria has produced “massive evidence... [of] very serious crimes, war crimes, crimes against humanity,” Ms Pillay said. “The scale of viciousness of the abuses being perpetrated by elements on both sides almost defies belief," she said. The evidence indicated responsibility “at the highest level of government, including the head of state,” she added. The inquiry has also previously reported it has evidence rebel forces in Syria have been guilty of human rights abuses. However, the investigators have always said the Syrian government appears to be responsible for the majority, and that the systematic nature of the abuse points to government policy. Syrian Deputy Foreign Minister Faisal Mekdad was dismissive of Ms Pillay’s remarks. "She has been talking nonsense for a long time and we don't listen to her," he told AP. He told the BBC Syria needed more money and equipment from the international community. He said Syria needed lorries and armored vehicles to transport chemicals to prevent “terrorists” attacking the vehicles on their way to the port of Latakia, where they will be loaded onto a US naval vessel for destruction. An OPCW spokesman at the conference told the BBC that any donations of dual-use equipment would be carefully monitored and there would have to be strict guidelines imposed to make sure the machinery could only be used for the purpose of removing the weapons. 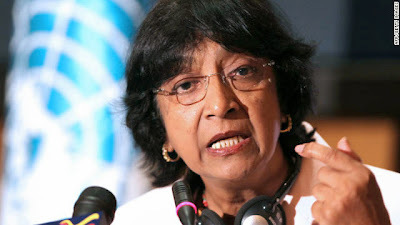 Ms Pillay said the UN commission of inquiry had compiled a list of those believed to be directly responsible for serious human rights violations. It is assumed senior figures in the Syrian military and government are on that list, the BBC's Imogen Foulkes reports from Geneva. However, the names and specific evidence relating to them remain confidential pending a possible prosecution for war crimes and crimes against humanity by the International Criminal Court (ICC). She has previously called on the UN Security Council to refer Syria to the ICC. Foulkes says Ms Pillay has repeatedly called on the UN Security Council to refer Syria to the ICC, something it has not so far done. Her surprising candor today may be a sign of her impatience. Syria is not a state party to the ICC and therefore any investigation into the conflict would need to be mandated by the Security Council. However, Russia and China have a veto on the council and would be highly unlikely to let such a move pass. Ms Pillay's statement is a reminder of the severity of the situation in Syria as preparations are made for the Geneva-2 peace conference next month, the BBC correspondent says. Ms Pillay, a former judge at the ICC, said perpetrators of crimes must face justice. "Accountability should be key priority of international community, and I want to make this point again and again as the Geneva-2 talks begin," she said. "I reiterate my call to all member states to refer the situation to the ICC." Both the government and the opposition National Coalition have said they will attend the conference, but the head of the Western-backed rebel Free Syrian Army has said it will continue fighting during the talks. The National Coalition says it categorically rejects any role for Assad in any transitional government, while the regime has said it is not going to negotiate a "handover of power". Also on Monday, the Syrian Observatory for Human Rights (SOHR), a UK-based activist group that monitors deaths in the conflict, said its estimate of the number of dead had now reached 125,835, more than a third of them civilians. Almost 28,000 rebel fighters had died, and more than 50,000 on the side of the government, including both regular soldiers and pro-regime militias. The latter figure also includes almost 500 dead from the Lebanese Hezbollah movement and other foreign Shiite militias. However, it said it believed these figures were an underestimate as both sides were reticent about reporting deaths in their ranks.